NEW ORLEANS – Collegiate records and division records didn’t stand a chance this past weekend. A few of these National Athletes of the Week, announced Tuesday by the U.S. Track & Field and Cross Country Coaches Association (USTFCCCA) helped rewrite the record books. Find out more about these athletes by clicking their names or scrolling below. CLICK HERE for a historical listing of National Athletes of the Week in outdoor track & field. 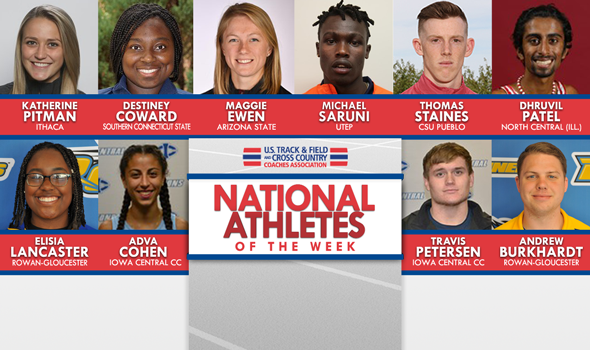 National Athlete of the Week is an award selected and presented by the USTFCCCA Communications Staff at the beginning of each week to eight collegiate indoor track & field athletes (male and female for each of the three NCAA divisions and NJCAA Division I). Jim Ryun’s collegiate outdoor record in the 800 seemed insurmountable for so long. Then Donavan Brazier broke it on its golden anniversary. Many thought Brazier’s record would stand the test of time. It did – for less than two years. Michael Saruni demolished Brazier’s mark this past weekend at the Desert Heat Classic. Saruni turned two laps in 1:43.25, which lowered the collegiate record by 0.30 seconds. This is the second time in the past two years that an athlete from UTEP has been named National Athlete of the Week following an incredible effort in the 800. Last year it was Emmanuel Korir who ran 1:43.73 at the Brutus Hamilton Challenge to earn the honor on May 2. Jenny Barringer and Maggie Ewen in the same sentence? Believe it. This past weekend Ewen became the first NCAA Division I female athlete since Barringer to hold two or more collegiate records at once. Ewen shattered Raven Saunders’ nearly two-year-old record in the shot put. The senior from St. Francis, Minnesota, heaved the orb 19.46m (63-10.25) to top Saunders’ in-season PR of 19.33m (63-5) by 5.25 inches. Right now Ewen owns the hammer record to go along with the shot put mark. Back in 2009, Barringer laid claim to the all-time top spot in the 1500, steeplechase and 5000. This is the second time this season that Ewen has been named National Athlete of the Week. Thomas Staines’ won the RMAC Outdoor Track & Field title in the 800 this past weekend, running a 1:48.34 (converted to an NCAA Division II leading time of 1:47.55 for altitude) that doubles as an Automatic Qualifying Mark. Staines’ time was the eighth-fastest in the event by any competitor on the week. This marks Staines’ second National Athlete of the Week award, as the sophomore from Colorado Springs, Colorado, also picked up the honor on Feb. 6 during the indoor campaign. Staines also becomes the first CSU Pueblo athlete, regardless of gender, to win a National Athlete of the Week honor for the outdoor track & field season. Destiney Coward posted the top hammer throw mark in NCAA Division II this past weekend at the Yale Springtime Invitational. Coward notched a mark of 65.40 (214-7), winning the competition while hitting an Automatic Qualifying Mark in the process. Coward’s throw also made her the second-best competitor in NCAA Division II outdoor collegiate history in the event, while her throw sits ninth all-time. This marks Coward’s second National Athlete of the Week award, as the senior from East Haven, Connecticut, also picked up the honor on Jan. 9 during the indoor campaign. Coward also becomes the first Southern Connecticut State athlete, regardless of gender, to win a National Athlete of the Week honor for the outdoor track & field season. Personal records and the Drake Relays go hand in hand for Dhruvil Patel. Last year Patel established his previous PR of 14:15.65. This year, he smashed that. Patel clocked a time of 13:58.27 this past weekend and beat a number of NCAA Division I and NCAA Division II athletes on his way to the sixth fastest time in NCAA DIII history. He is also currently ranked third on the Descending Order List for the 10000. This is the first time that a male athlete from North Central (Ill.) other than Luke Winder has been named National Athlete of the Week during the outdoor season. Katherine Pitman keeps raising the bar in the NCAA DIII record book. Last year Pitman established what was then the standard in the pole vault of 4.30m (14-1.25) at the SUNY Oneonta Final Qualifier. Pitman inched that mark up to 4.31m (14-1.75) this past week at the CNY College Challenge hosted by SUNY Cortlandt, a rare mid-week meet. The senior entered at 3.83m and went over that, 4.00m and 4.10m on her first attempt. She took three tries to get over 4.20m and then two tries at 4.31m. Pitman wasn’t done competing, though – not by a long shot. She defended her event title at the Penn Relays and set a facility record at Cornell. This is the second time in her career that Pitman has been named National Athlete of the Week during the outdoor season. Travis Petersen recorded the second-best hammer throw in all of NJCAA Division I this year at the Kim Janvrin Open over the weekend. The product out of Atlantic, Iowa, posted a throw of 57.97m (190-2), placing fourth at the meet, ahead of NCAA Division I competitors. Petersen becomes the fourth men’s athlete from Iowa Central CC to pick up a National Athlete of the Week award for the outdoor track & field season. Adva Cohen just continues to impress. One week after setting the NJCAA record in the 5000 at the Kansas Relays, the freshman from Jerusalem, Israel, added to her portfolio by winning the steeplechase event title at the prestigious Drake Relays with an NJCAA-record time of 9:52.37. Cohen finished more than 20 seconds faster than any competitor in the race. She also helped Iowa Central CC finish third in the 4×800 (9:12.01) and fourth in the distance medley relay (11:53.89). This marks Cohen’s third National Athlete of the Week award for the outdoor track & field campaign, and her eighth overall. Andrew Burkhardt notched the top javelin mark in all of NJCAA Division III this season at the Lions Invitational over the weekend. Burkhardt’s toss of 55.97m (183-7) is nearly nine feet further than any other competitor in NJCAA Division III on the season. He finished fifth at the meet, out throwing competitors from NCAA Division I, Division II and Division III. Burkhardt becomes the fourth men’s athlete from Rowan-Gloucester to pick up a National Athlete of the Week award for the outdoor track & field season, as well as the second this season, joining Joshua Legg (March 27). Elisia Lancaster sits atop the NJCAA Division III Descending Order List in the shot put and discus after her performance at the Lions Invitational. While there, the freshman recorded a shot put mark of 13.39m (43-11¼) while adding a discus throw of 40.44m (132-8). She is the only NJCAA Division III athlete to have marks over 13.00m in the shot put and 40.00m in the discus. This is Lancaster’s third National Athlete of the Week honor this season.